Where they have burned books, they will end in burning human beings, declared German poet Heinrich Heine. 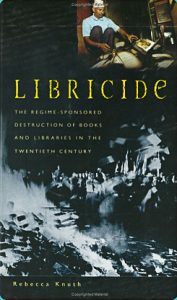 This book identifies the regime-sponsored, ideologically driven, and systemic destruction of books and libraries in the 20th century that often served as a prelude or accompaniment to the massive human tragedies that have characterized a most violent century. Using case studies of libricide committed by Nazis, Serbs in Bosnia, Iraqis in Kuwait, Maoists during the Cultural Revolution in China, and Chinese Communists in Tibet, Knuth argues that the destruction of books and libraries by authoritarian regimes was sparked by the same impulses toward negation that provoked acts of genocide or ethnocide. Readers will learn why some people—even those not subject to authoritarian regimes—consider the destruction of books a positive process. Knuth promotes understanding of the reasons behind extremism and patterns of cultural terrorism, and concludes that what is at stake with libricide is nothing less than the preservation and continuation of the common cultural heritage of the world. Anyone committed to freedom of expression and humanistic values will embrace this passionate and valuable book. 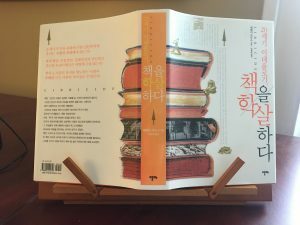 has been published in the Korean language! Praeger – Publication Date: May 30, 2006 Whether the product of passion or of a cool-headed decision to use ideas to rationalize excess, the decimation of the world’s libraries occurred throughout the 20th century, and there is no end in sight. Cultural destruction is, therefore, of increasing concern. In her previous book Libricide, Rebecca Knuth focused on book destruction by authoritarian regimes: Nazis, Serbs in Bosnia, Iraqis in Kuwait, Maoists during the Cultural Revolution in China, and the Chinese Communists in Tibet. But authoritarian governments are not the only perpetrators. Extremists of all stripes—through terrorism, war, ethnic cleansing, genocide, and other forms of mass violence—are also responsible for widespread cultural destruction, as she demonstrates in this new book. 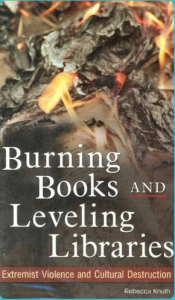 Burning Books and Leveling Libraries is structured in three parts. Part I is devoted to struggles by extremists over voice and power at the local level, where destruction of books and libraries is employed as a tactic of political or ethnic protest. Part II discusses the aftermath of power struggles in Germany, Afghanistan, and Cambodia, where the winners were utopians who purged libraries in efforts to purify their societies and maintain power. Part III examines the fate of libraries when there is war and a resulting power vacuum. The book concludes with a discussion of the events in Iraq in 2003, and the responsibility of American war strategists for the widespread pillaging that ensued after the toppling of Saddam Hussein. This case poignantly demonstrates the ease with which an oppressed people, given the collapse of civil restraints, may claim freedom as license for anarchy, construing it as the right to prevail, while ignoring its implicit mandate of social responsibility. Using military might to enforce ideals (in this case democracy and freedom) is futile, Knuth argues, if insufficient consideration is given to humanitarian, security, and cultural concerns. Errors of Omission and Cultural Destruction in Iraq, 2003.